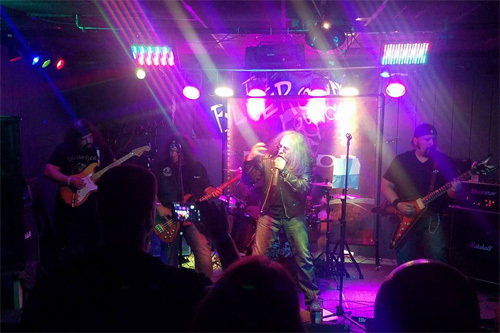 Formed just before the turn of the century in New Jersey by brothers and guitarists Frank and Joe Adamo, Legion is a traditional heavy metal. In the space of 17 years, the band released one album, 2005's Shadow Of The King. But internal difficulties and personnel hampered the band before arriving at the current line up and recording the new and second effort, War Beast. 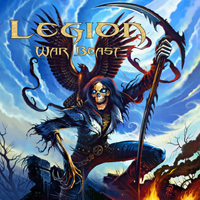 Now to say Legion plays traditional heavy metal is no understatement. This late Seventies and early Eighties deja vu all over again. It's basically the American side of the universally influential New Wave of British Heavy Metal: twin guitar harmony gives way to blistering dual guitar solos, a solid rhythm section for gallop and groove, and generally clean melodic vocals. But more on that last element in a moment. All this also means that it's music that's mostly found scrapping and scrambling in the heavy metal underground. Essentially, Legion has a compelling grasp of classic heavy metal. The music within War Beast is undeniably "keep it true" heavy metal and can stand with the best of 21st century traditional metal bands. But here's my thing with Legion, the caveat that nags at the nape of my neck, and I'm going to be quite candid here. Most everybody who visits Dangerdog Music Reviews and read my words knows how much emphasis and importance I put upon the vocals. I don't have a problem with raspy or gruff vocals as long as they're clean and melodic. Udo comes to mind, among many. Honestly, I'm not sure vocalist Ralph Gibbons can sing. He can sure scream, certainly go screamo which is, like, ninety percent of the time. It's nearly relentless at times. Maybe not so much like Cage's Sean Peck, but very close to James Rivera. What were the Adamo brothers looking for in a vocalist? Something close to Halford? So then is it scream-singing? I found it tiring. There is some modicum of moderation within When Life And Spirit Divide and Future Passed which leads me to believe Gibbons can actually sing. So what am I getting at. Unlike the latest from Metal Witch where the combination of metal and vocals eventually persuaded me, with Legion's War Beast, I found myself struggling to listen to and enjoy the heavy metal because of the vocals. Yeah. I can hear you. Geez, dude, get over it. Maybe so. But one thing you'll always get in my writing and reviews is honesty wrapped in some smidgen of creativity. Listen below and form your own opinion. Essentially, Legion has a compelling grasp of classic heavy metal. The music within War Beast is undeniably "keep it true" heavy metal and can stand with the best of 21st century traditional metal bands.